Get ready for Thanksgiving with this fun word search puzzle! And be sure to check out the rest of our fun Thanksgiving printables. 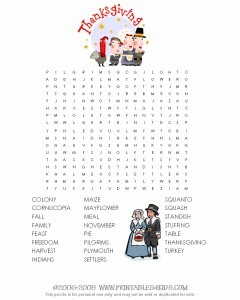 Click on the image to print and view full size or download the Thanksgiving Word Search Puzzle as a PDF file. Printable Thanksgiving games for the whole family! Thanksgiving Word Scramble Game, place cards, water bottle labels, and more printable goodies for your Thanksgiving gathering.